In 1995 the Regimental Council and the Trustees decided to record the Barracks which had once been used as the home and training Depots of our two Regiments. The East Surrey Regiment Depot at Kingston had long since been demolished and new married quarters for London District personnel had been erected in the place of the barrack blocks, messes, cookhouse and barrack square. Only the Keep survived at the entrance from Kings Road. A bronze plaque displaying the badge and an inscription was made and affixed to the front walls of the Keep. In 1992, Stoughton Barracks at Guildford was sold to a property development firm. The Keep, administration blocks, a barrack block (Peterborough Block) the officers’ mess were retained and converted to flats. The Association were consulted on names of the roads, and a number of past Queen’s Colonels were chosen, namely, Teviot Close, Fairbourne Way, Kirkfields, Torrens Close, Monro Drive, Giffard Way and Whitfield Close. The Keep retained its old name. In the case of Stoughton Barracks a large Paschal Lamb was installed over what had been the main entrance to the Barracks and a bronze plaque with badge and inscription fixed to the front wall. for service in Tangiers was, under the Cardwell Reforms linked to West Surrey. 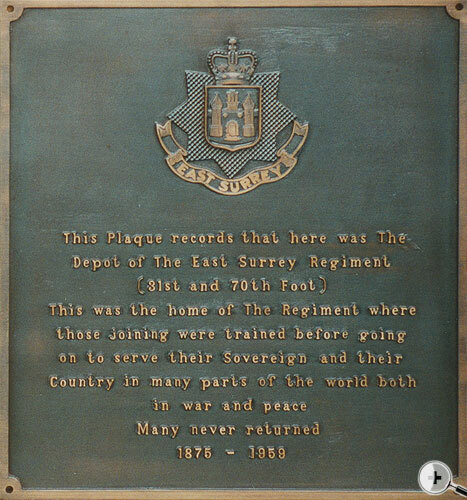 “This Plaque records that here was the Depot of The East Surrey Regiment (31st and 70th Foot).